Any cat owner will tell you that having a cat is similar to having a child. Their health and safety are a number one priority because we love them dearly and want them to be in our lives for as long as possible. We also spend the majority of our free time with our cats, so we are hyper-aware when they have physical, behavioral or mental issues. Just like humans, cats suffer from many different forms of pain, and keeping our cats healthy is essential. CBD oil for cats can be an excellent alternative to other forms of pain, anxiety and behavior medications that can cause harmful or undesirable side effects. Becoming knowledgeable on the many benefits of this legal, all-natural product could lead you to create a more calm and positive living environment for you and a better life for your cat long term. CBD oil is also known as cannabidiol. Cannabidiol is one of the active compounds found in cannabis. While there has been a stigma surrounding CBD oil because it derives from cannabis, it should be noted that cannabis has over 100 active compounds. When people think of cannabis, they usually think of tetrahydrocannabinol (most commonly known as THC), which is the most active compound. It’s also the compound which causes the “high” effect of marijuana. Cannabidiol, however, has no psychoactive effects and is used primarily for remedial purposes. What is CBD Oil for Cats? CBD oil is becoming increasingly popular as a treatment for pets as well as humans. CBD oil for cats is simply cannabidiol extracted organically from the hemp plant and administered in smaller doses. It is all-natural, non-toxic, and has little to no THC within the product. CBD for cats is generally considered to be a safe treatment for various ailments, whether behavioral or pain related, however, it is not proven to treat every disorder. Each cat will react differently to this treatment based on their individual personality and condition. You should consult with your vet before using any holistic treatments such as CBD oil. Holistic vets will be more likely to support usage of CBD oil for cats, because they encourage all-natural versus pharmaceutical remedies. Ultimately, correct CBD dosage for cats is the most imperative thing in determining your cat’s reaction to the product. If the right dosage is administered, CBD oil can provide excellent benefits. 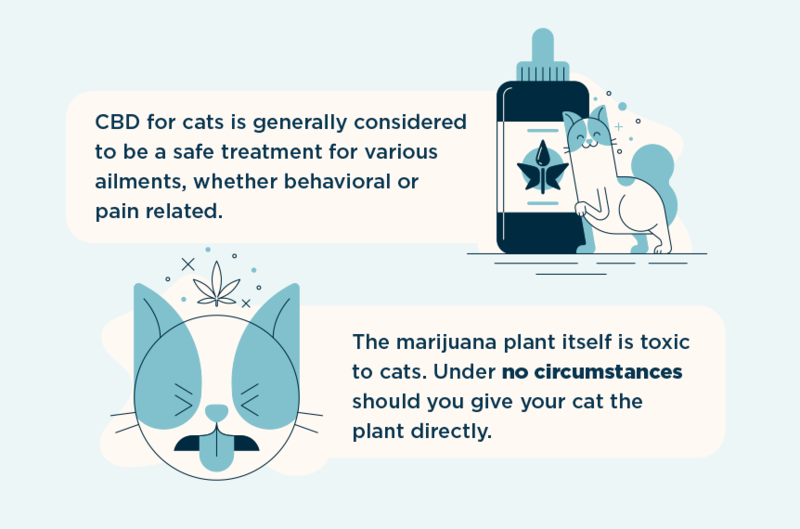 It is important to note that the marijuana plant itself is toxic to cats, so under no circumstances should you give your cat the plant directly. Sticking to CBD products is the safest way for your cat to benefit from the cannabidiol and avoid adverse effects. CBD oil can provide a variety of benefits for cats. Many of these are similar to the benefits that CBD oil provides for humans, because cats and humans share the same endocannabinoid system. 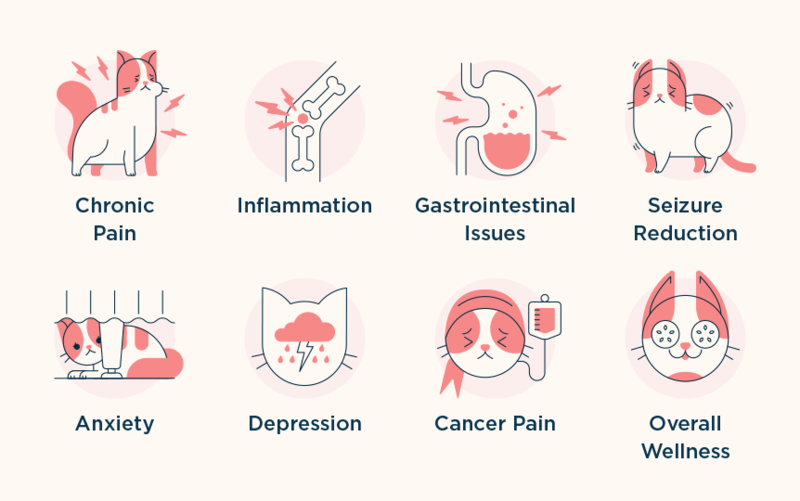 The endocannabinoid system regulates physiological functions, such as sleep, mood, pain, and immunity, and CBD oil for cats can treat chronic symptoms within these categories. There are also cases of CBD oil being used for more serious health conditions in cats as well. Below, we’ve detailed a few of the benefits of CBD oil for cats. CBD oil treats pain and inflammation in cats by blocking the vanilloid receptor, which regulates pain in both the feline and human bodies. This receptor stops sending pain signals throughout our bodies when it is inactive, and our swollen points of pain then begin to fade. Researchers are considering making CBD oil into its own drug class, because it has proven to be so effective in reducing chronic pain. Some of the chronic pain issues CBD oil can treat in cats and humans include arthritis and pancreatitis. Many gastrointestinal issues in cats, such as inflammatory bowel disease (IBS) are caused by inflammation, which means CBD oil can be an effective treatment. CBD oil has the ability to reduce both swelling and pain within the GI tract and keep your cat’s digestive system running regular and feeling more at ease. While CBD oil does not cure seizures, it has been shown to significantly reduce the number of episodes an epileptic cat or human has. This is a great alternative for many cat owners to consider, because many seizure medications on the market today can have serious long term side effects including anxiety and depression. CBD oil can provide reduction in seizures without having to trade off for another chronic condition. When it comes to mental disorders, CBD for cats can be beneficial in rebalancing the hormones in the brain that cause issues such as anxiety and depression. CBD oil can also increase your cat’s happiness by stimulating the adenosine and serotonin receptors in the brain. Aside from anxiety and depression, your cat may suffer from general fear or other behavioral issues, and CBD oil for cats can be a natural alternative to sedatives and other mood-altering drugs. There has not been a lot of research regarding CBD oil and cancer treatment in humans or cats, however, CBD stimulates homeostasis in the body, which can stop the growth and spreading of cancer cells. There have also been a few studies where CBD was tested on rats and mice, and some results have shown CBD to kill off cancer cells completely. While this is premature information, it is promising nonetheless. CBD is also helpful in dealing with the pain of cancer treatment, such as chemotherapy and the nausea associated with it. CBD oil for cats can ultimately improve their general health and wellness in many ways, such as increasing energy levels and enhancing your cat’s mood, skin, and fur. Research on the effectiveness of CBD oil is beginning to spread, and there are new CBD products popping on the market every day that will claim to be the best treatment for all of your cat’s conditions. However, not all CBD products are created equal. When choosing CBD for cats, make sure you’re buying a product specifically manufactured for pet use as opposed to humans. Also, search for an organic CBD product and ask for a certificate of analysis, which will prove that the product has been tested in a lab and is bacteria free, solvent free, and has less than 0.3% THC potency. How do You Give CBD Oil to Cats? There are three common types of CBD for cats which allow three different ways of administration. These include tincture or CBD oil, capsules, and CBD cat treats. Tinctures (oils)—Tincture is the most popular, most effective, and fastest method for administering CBD for cats. When people refer to CBD oil for cats, tincture is what they are referring to. It is administered through a dropper and can easily be dropped into your cat’s mouth. CBD tincture oil comes in many different flavors, so your cat should have no problem enjoying this oil each day. 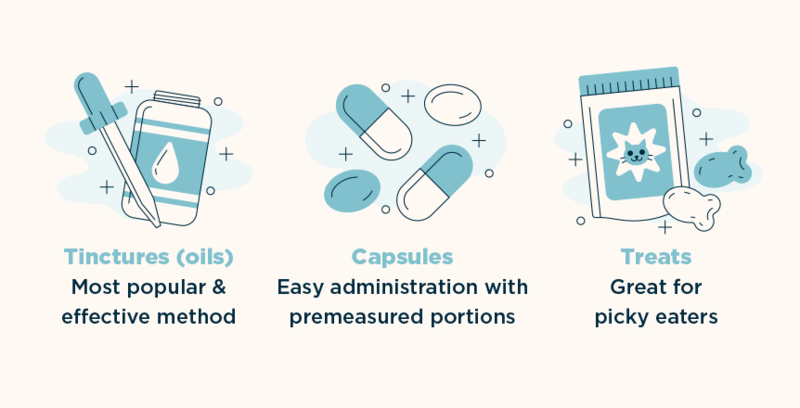 Capsules—CBD capsules are a great administration alternative for cats, because they come with premeasured portions of CBD oil inside and they can be given to cats 1-2 times a day to relieve any symptoms. Each pill usually contains 5-20 mg of CBD. You can wrap these capsules inside a pill pocket treat to give to your cat or hide them within your cat’s food. Treats—CBD cat treats are the most convenient way to give CBD to your cat. All cats love treats, so this is a great CBD product to try if you’re having trouble administering CBD oil or capsules, however, the dosage within CBD cat treats can be less precise and the effectiveness can be weaker as well. When determining CBD oil dosage for cats, it’s best to start with very small doses and slowly increase to the recommended dose depending on your cat’s condition. That way, you can see how your cat reacts to the CBD. You should ask your veterinarian about the correct dosage to give your cat, however, a general guideline is about 1 to 5 mg of CBD per 10 lbs. of weight. Pancreatitis— To start off, administer 0.045mg per pound of your pet’s weight twice daily. You can gradually increase it up to 0.2mg per pound twice daily. Arthritis— 0.2mg per pound of your pet’s weight twice daily. Seizures— 0.2mg per pound of your pet’s weight twice daily, which can be gradually increased. Seizures require a more aggressive treatment and can take up to 1.35mg per pound twice daily. Inflammatory Bowel Disease— 0.2mg per pound of your pet’s weight twice daily. Remember to monitor your cat closely for at least an hour after administering CBD products for the first time. You’ll want to make sure you’re getting the dosage right, because weight and personality can both determine your cat’s response. 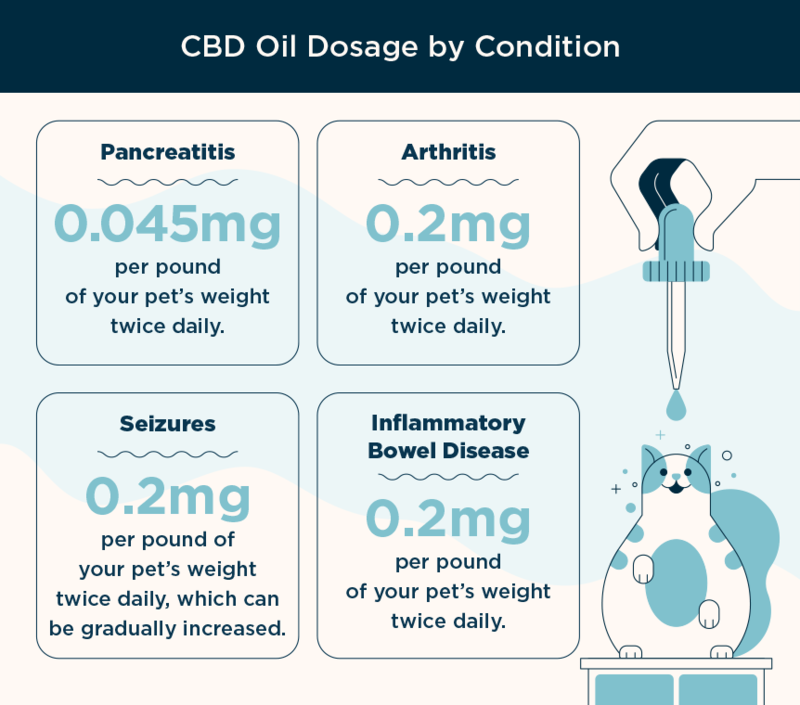 CBD oil products for pets can be marketed in different bottles specifically for cats and for dogs, but this is just to make people buy more of each. Once again, CBD dosage is going to be your main concern. If you buy a CBD product with a picture of a dog on the front, don’t be alarmed. Just make sure you’re giving your cat the correct dosage based on their weight. Don’t be afraid to bring up CBD oil and its benefits to your vet. While they may be hesitant or resistant to it, your vet needs to know the treatment you are using so that they can work around it in other areas of your cat’s care. You can talk about research you’ve seen and/or stories of other pet owner friends who may be using CBD oil and experiencing good results. Are you familiar with any studies on CBD oil for cats? Have you seen CBD oil benefit any other pets in your clinic? What potential risks or side effects have you encountered with CBD use in pets? The ease of buying CBD oil for cats will depend upon the state where you reside. Of course, if you’re residing in a state where cannabis products are legal, such as California, Oregon, Colorado, or Washington, then you can easily visit a local dispensary and pick up any CBD products you desire. However, if you live in a state where cannabis is illegal, be aware that CBD products are still legal if they contain less than 0.03% THC (which is what you want). These products can sometimes be found at local pet stores or you can order them online. When ordering online, make sure to look for organic products that come with a certificate of analysis as mentioned above. Before giving your cat CBD oil, it’s important to understand the potential side effects of CBD oil for cats, so that you’re both fully knowledgeable and prepared. While many people choose to use CBD oil for cats because there is little risk for adverse effects, every cat is different and there is always a chance that these side effects can occur. As mentioned above, most side effects occur when CBD oil is given in improper doses that are too high for your cat, so if you do notice minor adverse effects, the first thing to try is reducing the dose. One of the most common side effects of CBD oil in cats is drowsiness. 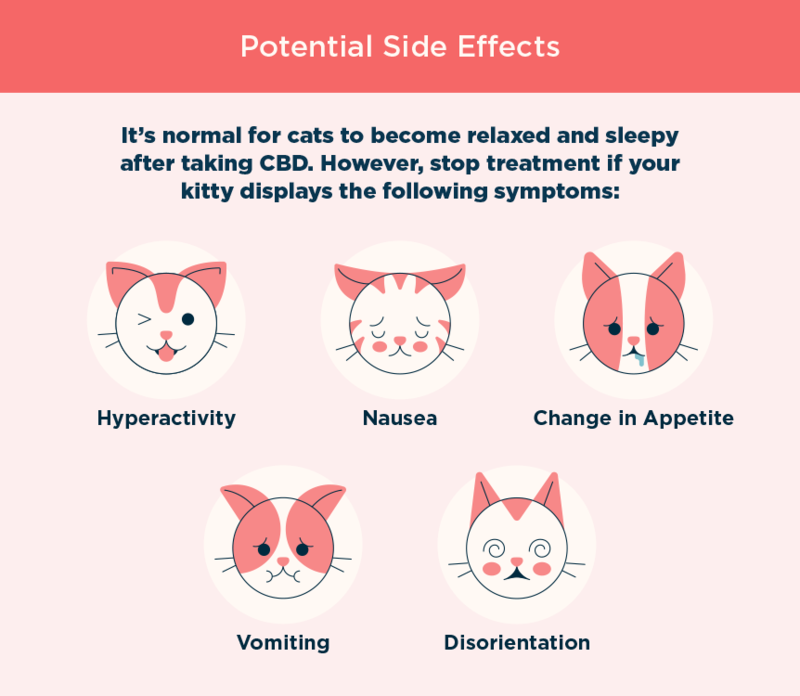 Many cats have a tendency towards sleepy behavior naturally, so this may not be noticeable at first, but it’s necessary to keep an eye on your cat to make sure you haven’t given your cat too much CBD oil to the point where they are sedated throughout the entire day. Other potential side effects of CBD oil for cats depending on your cat’s tolerance could be anxiety, nausea, a change in appetite, disorientation or vomiting. These are rare, however, if any of these side effects occur, it’s important to stop administering CBD until you speak with your veterinarian. Remember once again that the marijuana plant is very toxic for pets, so you should never give your pet CBD oil that is extracted from the marijuana strain. Stick to CBD oil that is extracted from hemp and contains less than 0.03% THC. CBD oil for cats is an all-natural alternative to the many manufactured medications out there that can cause harmful side effects and long term distress. Treating your cat for their mental, behavioral, or physical conditions should not have to be a give and take. With CBD products, your cat has the potential to live a long and happy life free of pain, stress, and fear. CBD oil is completely legal throughout the entire United States when you buy CBD extracted from the hemp plant, which contains little to no THC. This type of CBD does not have a psychoactive effect, and your cat will not feel “high” whatsoever from this product. CBD has the potential to prevent and cure many conditions in cats and humans alike, including chronic pain, anxiety, and depression. It can reduce seizure episodes, improve gastrointestinal issues, and there are studies showing its possible benefits in cancer treatment as well. 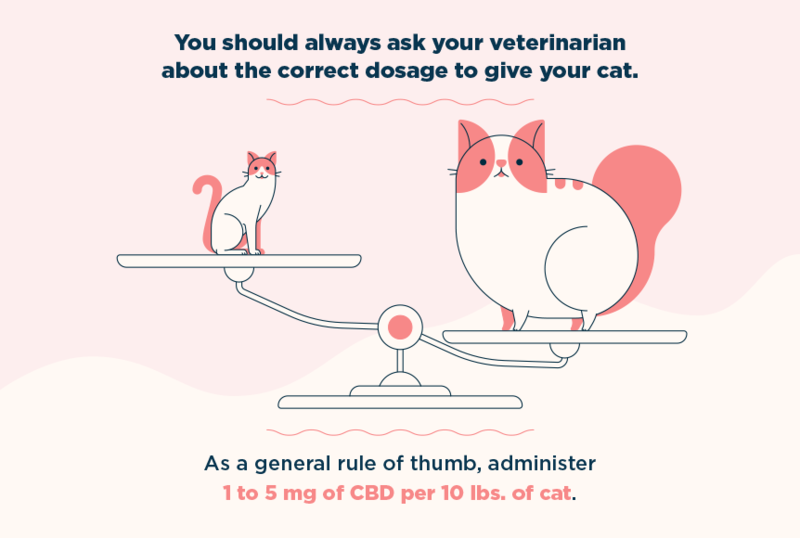 When administering CBD oil to your cat, it’s as easy as dropping a few drops of the oil in their mouth, feeding them a capsule, or tossing them a CBD cat treat. CBD dosage in cats will depend upon the ailment being treated as well as your cat’s weight. It’s always best to consult your veterinarian when determining the best treatment and dosage plan. We hope in reading this article, you’ve gathered all the information necessary to make a proper decision on whether to try CBD oil as a treatment for your cat. With a slim possibility of harmful side effects and limitless possibilities of improving your cat’s quality of life, CBD oil could be the solution that meets all of your cat’s needs.